A black and white photograph of John Dundas Howden's house. 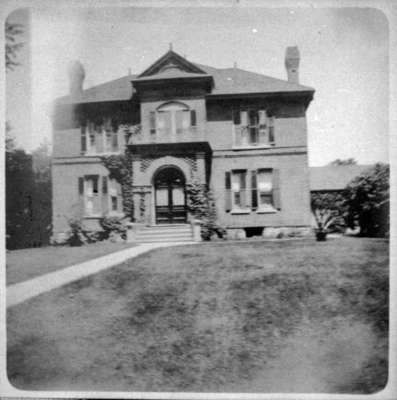 This house was located at 840 Dundas Street East (on the north side of Dundas Street opposite Craydon Road). This house was demolished in 1964 and the Georgian Courts apartment buildings were built on the site the following year. John Dundas Howden was Whitby's postmaster from 1885 to 1924. Whitby’s house numbering system was provided by Rev. Dr. James Roy Van Wyck (1877-1941), a retired Presbyterian minister. Van Wyck provided this service to the town, free of charge, during the Great Depression. By the summer of 1935, Whitby had a population of about 4,000 people and a house numbering system was needed. Prior to 1935, residences and businesses were listed in the telephone book with the street on which they were located. As well, there was no need for a house numbering system since all mail was picked up by local residents from the town post office. Under Van Wyck’s system, each block was numbered by a hundred. For instance, the first block south of Dundas on Brock Street was the 100 block; the second, the 200 block, and so on. Buildings on the west side of the street were given even numbers, while buildings on the east side were given odd numbers. On streets running east and west, even numbers were given on the north side while odd numbers were provided on the south. Van Wyck was careful to assign numbers for vacant lots between existing homes. Assigned house and business address numbers were published in the Whitby Gazette and Chronicle and a postcard was mailed to each residence in 1935 with the assigned house number and asking residents to please place this assigned number at their front door. Brooklin was given a house numbering system in the late 1960s or early 1970s, while Ashburn, Myrtle and Myrtle Station received a house numbering system in the 1980s or 1990s.